I've been brewing like mad lately. I think my fermentation chamber has been constantly full since the middle of January. I brewed a hoppy American Pale Ale that's just about ready to sample, and then a Hefeweizen that's currently souring at the hands of Cantillon dregs. Next up is a Hefeweizen, done two ways, with soft fruits in common. Half the batch will be dry-hopped into oblivion with Amarillo hops, the aim being to pull out some nice apricot and peachy flavour to sit against the spicy, clovey quality of the yeast. The second half will be flavoured with a combination of mango and passion fruit. The yeast is the real motivation behind this batch. 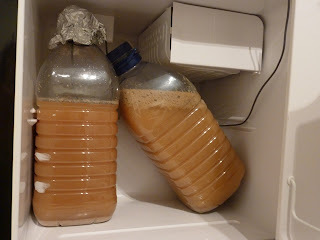 I harvested loads from the Lactic Weisse and it seemed a shame to waste it. The grist consists of a Maris Otter base, some munich for malty complexity and then oats (because, again, I didn't have any wheat to hand). The base wort was hopped to 10 IBU's with an addition of Amarillo at 60 minutes and then with a small addition at flame out. Three days into primary fermentation, I added a puree of passion fruit and mango. 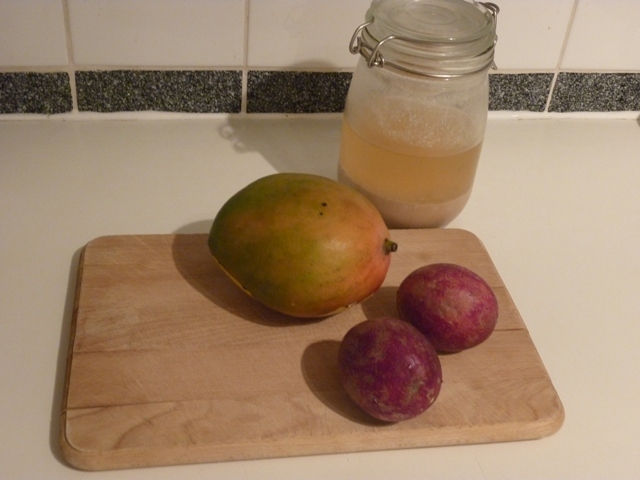 The passion fruit was passed through a sieve and then blended with the mango and a little boiling water to loosen. The whole mix was then passed back through a sieve before being heated to 70c in an attempt to pasteurise. The aroma that's currently escaping the fermenter is an irresistible amalgamation of tropical fruit salad and spicy, phenolic yeast. Looking forward to sample these two in a couple of weeks time. Sounds great Mark. I'm slightly obsessed by hopfenweisse, and have just read Stan H's "Brewing With Wheat" to get a bit more insight into how to be a better wheat beer homebrewer. They say that fermentation is key to making good beer - that's even more true for a hefe, I think. It's all about the yeast and how you treat it.